Yesterday was wild. It’s hard to condense the crazy things that happened. I have a longer version of events but I’ll post it later. Here’s the Reader’s Digest version. I left Memphis and immediately got lost. Then I got on the right road and later, while trying to avoid going on the interstate, I got lost again. 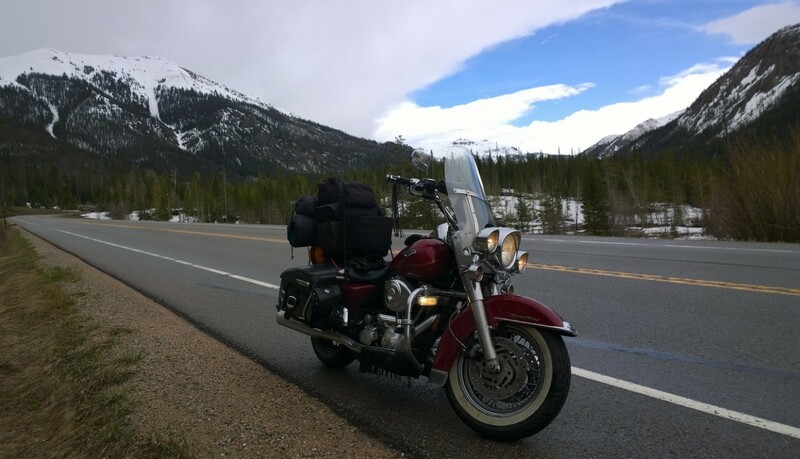 But before I realized this road I’d chosen was a dead end I did get to experiment with speed on the Road King. I managed to get her up to 95 mph before I got scared. She could have easily gone faster. Then I saw the highway dead end sign and had to turn around. I took some alphabet road, A, I think, and got back to the interstate. I resigned myself to take it. And I did. But it was the wrong interstate and before I knew it I was heading back over the Mississippi River into Tennessee again. I didn’t want to go there! I pulled over to consult my map and within 2 minutes a man stopped to check on me. That’s a great thing about being on a motorcycle. So many people stop to help. He suggested that instead of going back over the river to Missouri I take roads on the Tennessee side and then take the ferry at Hickman, Kentucky back across the river. I assumed that this was an omen/ the Tao/God, and did so. This is probably a good time to explain my navigating difficulties. I don’t have GPS and I don’t have a tank bag to hold a map so I try to memorize where I’m going and put some notes on a see-through magnetic bag I have that sits on my gas tank. So if I get lost I can either “wing it” or stop and consult my map. The little gray cells in my brain aren’t too good so I get lost a lot. And I hate to stop and consult a map. Anyway, this trip is about trusting things. Trusting God, flowing with the Tao. By the time I got to Hickman I was low on gas. So I had a choice: follow the signs into Hickman or follow the signs to the ferry. I headed toward the ferry, figuring there would be a town on the other side and a gas station. When I got to the ferry and drove the bike onto the “Dorena” I quickly met the congenial ferry man. Apparently, according to him, the nearest gas station was 18 miles on the other side, in East Prairie. There was no way the bike would make it that far. Then he said he had some gas he could give me and after we got underway he brought over a red plastic container and I poured some petrol into Big Red. I tell you now, he saved me. I would never have made it those 18 miles without his help. I had a beautiful 30 minute ferry ride across the Mississippi and it cost me 5 bucks. Next, after 18 miles and seeing no one, I stopped at a truck stop to gas up. Suddenly, a huge thunderstorm rolled in and kept me pinned for an hour. That was it for yesterday. I headed to the nearest town, Sikeston, and got a room at the Day’s Inn. Classy place, despite not having a bottle opener near the sink. It was a crazy day. 3 times over the Mississippi but I’m here and safe and grateful for this adventure.